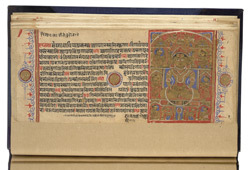 This manuscript of the 'Uttaradhyayana Sutra' was written in Prakrit prose and verse in the 16th century. The image shows Mahavira seated in 'padmasana' in the Pushpottara heaven, before his reincarnation on earth. The 'Uttaradhyayana Sutra' is a work of mixed authorship compiled over several centuries.